For a team that experienced its championship coronation in November, the Tar Heels have flown mostly under the radar this season. Yes, North Carolina has spent all of the season in the Top 10, but it wasn't until Saturday's blasting of Duke at Cameron Indoor Stadium that everyone let out a collective, "Wow. That UNC team is really good and looks like a No. 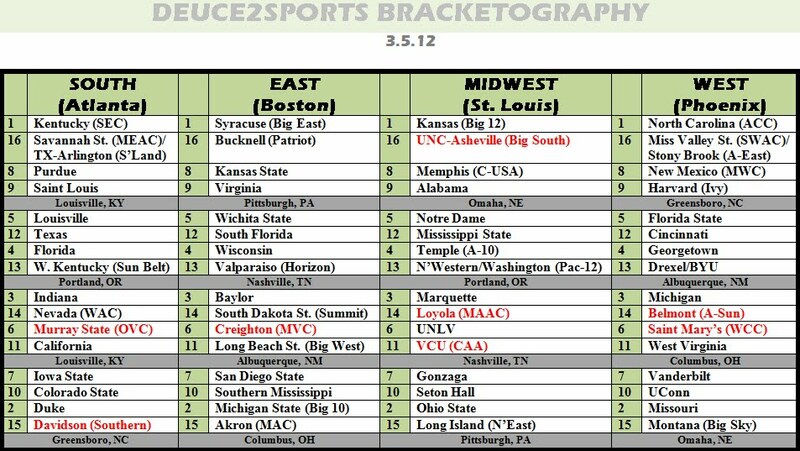 1 seed." At this point, I'm not sold on UNC as a definite No. 1 seed; I think the hype surrounding the game at Duke -- a place where the Blue Devils have lost three games this year -- and UNC's emphatic victory has inflated the Tar Heels' overall resume. That said, the selection committee will have to decide between UNC, Kansas, Michigan State, Ohio State and Duke for the final two No. 1 seeds. The conference tournaments likely will be the deciding factor but we're really splitting hairs at this point. Kentucky and Syracuse are sure bets as No. 1 seeds and everything else is an educated guess. Below is the updated bracket (as of Monday night). It is getting more and more difficult to seed the final 12 teams or so because of bracketing rules as well as how poor the resumes actually are. Kentucky, after a big road win at Florida to conclude a perfect SEC regular season, regained the overall No. 1 seed. While bracketologists are split on where Kentucky will end up (South Region in Atlanta or Midwest Region in St. Louis), I have the 'Cats in Atlanta. While it might be 40-50 miles further for Kentucky, Atlanta is SEC country and would feel much more "homey" compared to St. Louis which would be very pro-Kansas or pro-Missouri. North Carolina takes the final No. 1 seed. Overall, UNC is in the same group as Michigan State and Ohio State for the West's No. 1 seed. While Michigan State still has an outside chance at the West's No. 1, not winning the Big Ten Championship outright hurts. The same can be said for Ohio State. However, if both UNC and Duke don't win the ACC Tournament and either the Buckeyes or Spartans win the Big Ten Tournament, things could change. While Washington won the Pac-12 regular season, the Huskies shouldn't think that will get them in the dance. This resume is terrible, yet because there are so many terrible bubble teams Washington remains as Team No. 68. 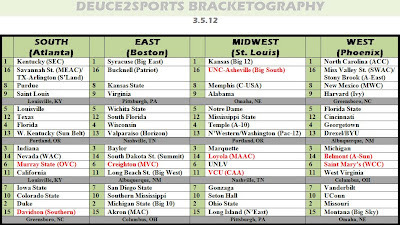 Even Northwestern, which has just two wins against projected tournament teams (No. 2 Michigan State and No. 10 Seton Hall) still has a spot. FIRST FIVE OUT: Oregon, Xavier, Miami, NC State, Dayton. Yes, you are reading those names correctly. Teams Nos. 69-73 are this bad, too. Xavier has the best chance to move up with some big wins while Dayton has some opportunities as well. If all goes to plan, Xavier and Dayton should meet in the quarterfinals with the loser waiting for the NIT seedings. Temple and St. Louis are the only "good" wins that either team can get, meaning the winner of this quarterfinal game will have a great chance to notch a possible ticket-punching win against St. Louis. Temple should await in the finals. No offense, but if Temple and St. Louis fall early, wins against the Bonnies, St. Joe's or La Salle just won't impress the committee. Winning the A-10 would be the only way for either to guarantee a spot in the Field of 68. NC State has the tools to make a run in the ACC Tournament. After a must-win first round game against Boston College, the Wolfpack have a winnable game against Virginia. Win those two and it'll be a fairly impressive showing. Even in losing a potential semifinal game to North Carolina, as long as it's not a terrible blowout, the Wolfpack might have done enough to pass other teams that faltered early in conference tournaments. Looking at potential "bid thieves," I see the following conferences as having teams that could steal spots from lowly bubble teams: The five notable power conferences (ACC, Big East, Big 12, Big Ten, SEC), the A-10 and the Mountain West. There are teams definitely safe in those conferences, but if a team like Iowa wins the Big Ten, Oklahoma State wins the Big 12, Pitt wins the Big East, NC State wins the ACC, Tennessee wins the SEC, St. Joe's wins the A-10 and Wyoming wins the Mountain West, there could, theoretically, be seven bubble teams sent buh-bye. Is that likely to happen? No, but if half of those results hit, you're looking at current First Four teams enjoying life in the NIT.